Today I am going to talk about something very important that is how to spool a spinning reel properly and avoid the line twist. If you don’t spool your reel correctly you can seriously mess you up when getting a fighting fish. Nothing is worse than suffering from equipment disaster being on the water struggling with a fish. In fact, most of these tragedies are created by the angler themselves. A lot of fishermen have problems with twist and tangles when they go to put a new line on a spinning reel. If you’re one of them, this article is for you. The line will behave better on the reel and let you cast more neatly and easily if you can spool your spinning reel correctly. All you need is to read this article thoroughly for assistance. If you go step by step and follow the tips as below, you can make your day. Follow These Steps- It’s That Simple!! A lot of people face twist and tangle problems while reeling in their fishing line. 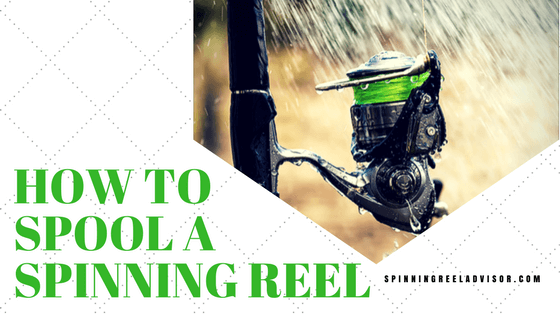 Follow these simple steps to prevent twisting during putting a new line into your spinning reel. The first concept is to know in which direction the reel’s bail turns and the line comes off the spool. Determine The Direction Your Reel Bail Spins: Depending on brands each reel’s bail turns in a certain direction, clockwise or counter-clockwise. Spinning reels, unlike other types of reels, are designed to hang down from the fishing rod. So you will need to hold the empty spinning reel with one hand the way it would be oriented on the rod and spin the bail on your reel slowly. You will see your bail’s spinning direction. Notice it. Determine The Direction Your Line Is Wound On The Spool: Place the filler spool on a flat surface, label facing up. Grab a line and see how it is coming off. A friend can help holding it a short distance away from you. Sync Your Reel and Line: The fishing line should come off the spool in the similar direction of the bail’s rotation. If your reel rotates clockwise, make sure the line is also coming off the filler spool in a clockwise manner. If it doesn’t match, just flip over the spool to sync up the directions. Do it similarly in case of a reel that spins counter-clockwise. Use either a uni-knot or an arbor knot. It is used to tie fishing line and backing onto the reel. So the first thing you will do is to tie a regular overhand knot at the tag end of the line. Next wrap the line around your spool. Tie another overhand knot here with the standing line as it comes onto the spool. Slide the knot down so that the first knot is outside of the second knot. Pull it tight to secure the knot and trim the tag end. The extra ¼ inch of the line that remains above the second knot will prevent it from loosening. Slowly turn the crank handle with your hand that you would use for cranking. Add a little pressure with fingers of your casting hand by passing the line between them. If you do it by yourself, place the filler spool on the ground. If a friend helps you, he must hold it parallel to your reel spool. In both cases, make sure that the way your line is coming off the filler spool matches with the direction of the reel spool spins. Once you have done spooling, you don’t want to fill it right to the top. Always fill the reel spool up to within 1/8 inch or 3.2 mm of its rim. Otherwise, it may result in over-spooling or under-spooling that may cause a lot of line twists and cast problems. Overfilling can cause the line to absorb more water to slip past the flange when it gets wet and cause a backlash while casting. Under-filling will make casts shorter because of the friction between the line and the reel spool’s top flange. There may be tab or mark on the reel spool and you will know that if you have filled it to the right amount. Once you have done with spooling the perfect amount of line, cut off the filler spool line. Thread it to the guides, tie on your favorite lure, and you are ready to start fishing. How To Prevent Line Twists? The worst thing you can do possibly is to place a pen or pencil on the line spool and just reel it on up. It will do nothing but create a lot of tangles and twists on your line. Instead, you should match the directions of your reel’s rotation and the way the line comes off while trying to spool a spinning reel. Both over spooling and under spooling cause problems while fishing. Make sure there is a 1/8 inch to 1/16 inch gap right between the top of the spool and the line. That’ll allow you to ensure that it’s not over spooled or under spooled. Or keep it within the mark on the reel if there any. If the line is loose, you may face a lot of tangles while casting. Hold out your hand toward the lead guide and apply a little bit pressure to the line as you are spooling on the reel. Let the line run through your thumb and index finger to keep a nice steady pressure when you start winding. Check if there is any line twist for few times after cranking. Just let the line go flat to do this. You should not have twist if you have followed the “direction matching method” that we have talked earlier. If still there is a twist, just flip over the filler spool and start again. Loading correctly your line is of supreme importance. Anything wrong in this process will cause the line to twist into coils and tangles when you cast that results in a nightmare later. So you must need some instructions about how to spool a spinning reel properly. Hopefully , his article will help you to avoid this crisis to a maximum extent.